A US Supreme Court Justice was dead. Murdered by an unknown assassin who was leaving not only a bloody trail through DC, and his own personal calling card behind. A possible serial killer who may have murdered before, and was willing to kill not only the target, but innocent victims who were in the way. Adam Raiker's friend was dead. Now, Justice Reinbeck's widow was asking him to agree to investigate the case. Due to the high profile, he knew that Raiker Forensics would never be asked to join in the investigation, but a widow's request to political heavyweights can open doors. Soon, Adam found himself on one of many teams trying to stop the killer. Used to being in charge, Adam was relegated to being on a team that reported to his ex-partner from the days he was in the FBI. A man who made no attempts of hiding his displeasure of having Adam working the case. Also on the team was Jaid Marlowe, a woman that years ago he had pushed out of his life. Their relationship may have been in the past, but it was unnerving how easily she slipped back into it once again. Adam didn't have time to grieve, or pursue a relationship. Someone else seemed to have him in his sights, and a ghost from his past was just not staying there. Too many unexplainable coincidences were merging to form a deadly connect the dot straight to Adam Raiker's door. 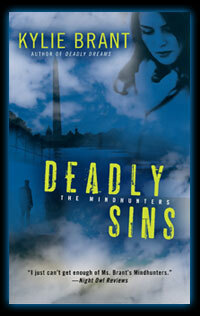 Deadly Sins was yet another chilling thriller from cover to cover. Finally, Adam Raiker's story is told, not only the past, but the romance readers have been eager to have. Jaid was a perfect heroine for the strong willed Adam who quite expected to have his directives followed. That might work for his employees, but Jaid was his equal on this team, both in the field, and out. Deadly Sins does not completely stand on its own. The secondary mystery has many references to events in previous books.